Johnstown features specialty shops ranging from technical running gear and the latest fashion, to spectacular hunting and fishing shops. The athletic shoe, hiking boot, and casual footwear selection is the largest in Johnstown with everything for toddlers to all athletes, from serious hikers to beach goers, and from hunters to the fashion conscious. There is a World Class golf shop, bike shop, ski shop, canoe and kayak shop, and fishing shop. The gun and hunting shops have the largest selection of guns in Colorado, ranging from everyday shooters to collectible firearms. Special attractions include a huge 16,000 gallon aquarium, a 65-foot, 16-car, operating Ferris Wheel, photo opportunities, a wildlife mountain, shooting galleries, and laser shot shooting simulators. Customers are able to test their golf, soccer, hockey, baseball, football and basketball skills on the sport simulators. There is a walk of US Presidents featuring two fully animated, talking presidents. No shopping experience would be complete without tasty treats; SCHEELS deli and fudge shop, named Ginna’s Cafe, serves gourmet soups and sandwiches, Starbucks® coffee and specialty drinks, 24 flavors of homemade fudge, and 18 flavors of gelato, which makes the shopping adventure something unlike the Johnstown retail customer has ever experienced. Johnstown SCHEELS employs over 400 associates. SCHEELS provides the best training in retail for its career associates. 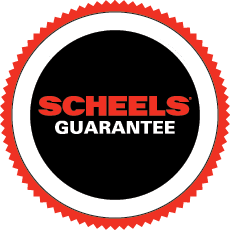 The people at SCHEELS make it special and SCHEELS associates are among the highest paid in retail, with outstanding benefits. SCHEELS is an employee-owned, privately held business that owes its consistent success to its empowered associates, leaders and partners who think and make decisions for their individual store and the entire company. A 16 car ride standing up at 65 feet tall, our Ferris Wheel will give you a chance to see everything from a whole new view. See inside the Aquarium like you’ve never seen before! Our aquarium features every type of freshwater species known to man inside of the gargantuan 16,000 gallon sized tank. It has its own coral reef and maintained by full time staff SCUBA divers which feed the fish daily. Serving gourmet soups and sandwiches, Starbucks coffee and specialty drinks, 24 flavors of homemade fudge, and 18 flavors of Gelato! Test your aim in our nostalgic shooting gallery! Honor our forefathers with a tour of the “Scheels Walk of Presidents”, including two full animated talking presidents. Each life-sized president is constructed and costumed the way history remembers them. Test your soccer, hockey, baseball, football and basketball skills in our sport simulator!